A very discrete recessed LED wall light with glare guard. Delivers 56 lumens. Part of the discrete LD42 family, the LD42W has a built in glare shield. 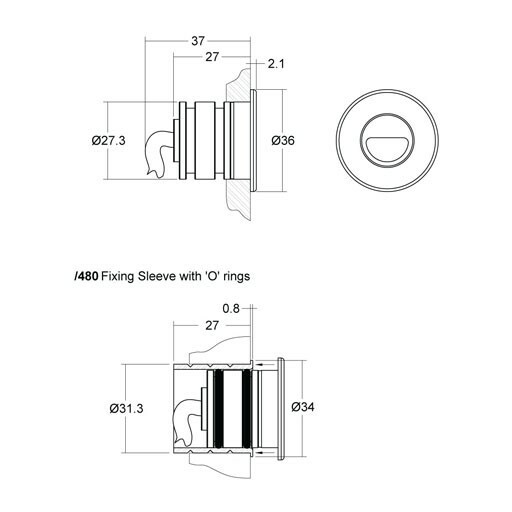 This is particularly useful in low level applications like step lighting, especially when a curve in the steps means that you are sometimes looking at the fittings front on. The fitting delivers 56 lumens in warm white, with a very high Colour Rendering Index of 93. This works well washing across lovely wooden or stone floors, or carpets. Rated IP68, the LD42W can be used internally or externally. The LD42W has been designed so the LED is maintainable. 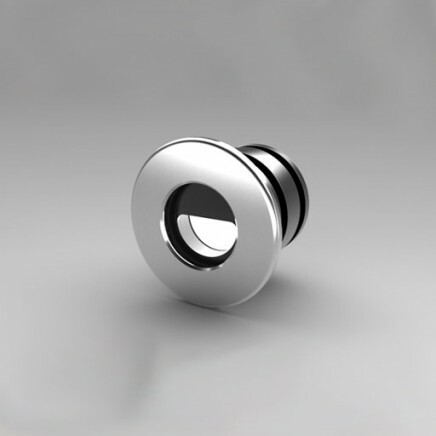 The LED assembly is mounted on a threaded heatsink which screws into the body, sealing the fitting and providing a thermal track to the black anodised body. Note output will be 40% less due to the glare shield. A very low glare miniature recessed LED wall light, delivering 94 lumens. Part of the discrete LD42 family, this powerful low glare fitting has a with a set back lens assembly and black anodised interior finish. It is particularly useful in low level applications like step lighting or low level floor washes. The fitting delivers 95 lumens in warm white, with a very high Colour Rendering Index of 93. This works well washing across lovely wooden or stone floors, or carpets. Rated IP68, the LD42 can be used internally or externally. The LD42 has been designed so the LED is maintainable. The LED assembly is mounted on a threaded heatsink which screws into the body, sealing the fitting and providing a thermal track to the black anodised body. A very discrete recessed LED wall light, with glare guard and the light angled down 25 degrees. Delivers 56 lumens. 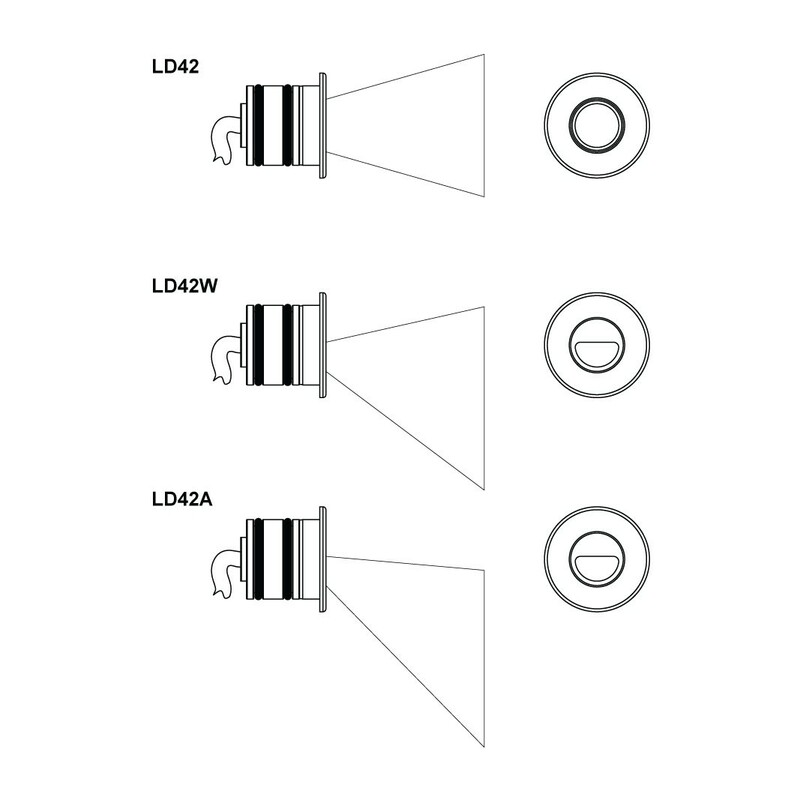 Part of the discrete LD42 family, the LD42A has a built in glare shield and utilises a special film which focuses the light downwards by 25°. This is particularly useful in low level applications like step lighting, especially in situations where you might be looking at the fittings front on. The fitting delivers 56 lumens in warm white, with a very high Colour Rendering Index of 93. This works well washing across lovely wooden or stone floors, or carpets. Rated IP68, the LD42A can be used internally or externally. The LD42A has been designed so the LED is maintainable. The LED assembly is mounted on a threaded heatsink which screws into the body, sealing the fitting and providing a thermal track to the black anodised body. 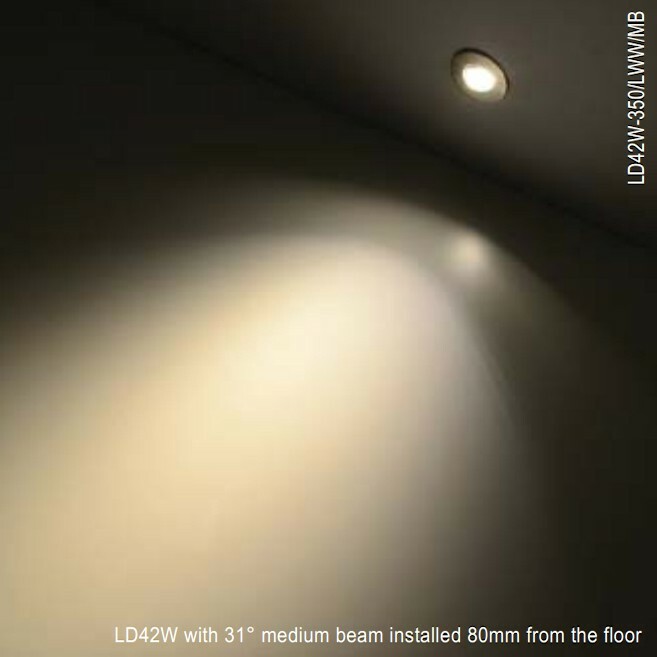 LD42W is a powerful, miniature recessed led, useful for low glare floor and step illumination and internal/external highlights. Comes pre-wired with a 2 core 100mm lead. The cable run between the driver and the fittings shouldn't exceed 10m. The driver should be located somewhere discrete, allowing air movement, and accessible for maintenance.